DH Tree Services is a family-owned business that provides tree care and garden maintenance services across Surrey and the surrounding areas. We deliver a competitively priced service that covers all your tree and garden requirements, from tree pruning and tree felling to stump removal and garden clearance. Our experienced Arborists are fully insured, reliable and professional, with the expertise you need to keep your garden in great shape all year round. 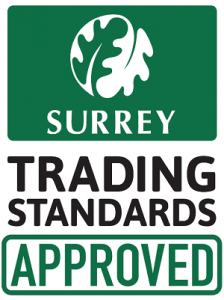 Every Arborist at DH Tree Services is fully qualified to industry standards and works in compliance with British Standard BS3998 (which covers recommendations for tree work). Before we start any work on your property we carry out all the required local authority checks free of charge to ensure that the work can go ahead. We check for Tree Preservation Orders and whether your tree or site is part of a recognised Conservation Area. We also organise any paperwork necessary to receive permission to proceed with the work. You can rest assured that for every job we undertake, any legal requirements will be addressed before we start. DH Tree Services has established itself as a trusted local business over the years by providing a high-quality level of garden care. We pride ourselves on delivering a friendly and expert service every time, and we enjoy sharing our tree and plant care know-how with our clients to help them achieve the results they desire. 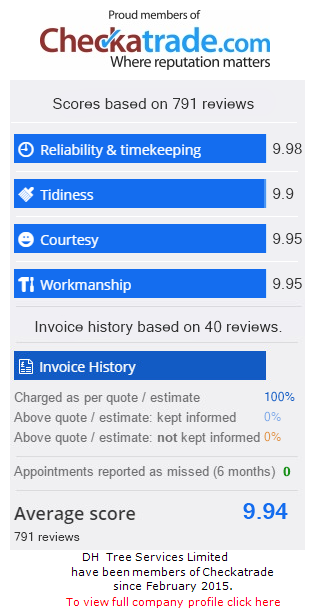 We have many returning customers, and you can find numerous positive reviews of our business on Checkatrade. The team at DH Tree Services has been operating in Surrey for many years and has acquired a wealth of local knowledge while working across the county and nearby areas. We can provide you with tailored advice on how to develop and maintain your garden, and we can give you expert guidance on planting the best trees, shrubs and hedges to suit your garden plans, your soil type and your location. DH Tree Services is passionate about the trees and the land we work on, and we strive to operate in an environmentally friendly manner. We re-use and recycle all tree and garden waste, and we use the waste wood from our tree surgery work to produce seasoned logs for our customers. We can also supply wood chip if required. Although we primarily work with domestic customers, we also offer larger-scale commercial and public sector services. Please contact us today to find out more about our range of services and how we can help you with your garden or ground maintenance requirements. We are within easy reaching distance of all areas in Surrey and South West London, for example Epsom, Cobham, Croydon and Reigate.